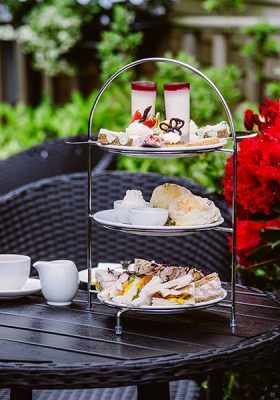 Cash gift vouchers are always a welcome treat as they can be exchanged or used in part payment in our award winning Restaurant, gift shops or nursery. May be used as full or part payment. Must be used in one transaction in either the restaurant or nursery (nursery includes gift shop & boutique). Can be redeemed against food/beverages/gifts/plants/nursery items/boutique. Must be used within six months from date of issue. To validate voucher, receipt must be attached to reverse. Price of postage on our vouchers is £2 as we use recorded delivery. 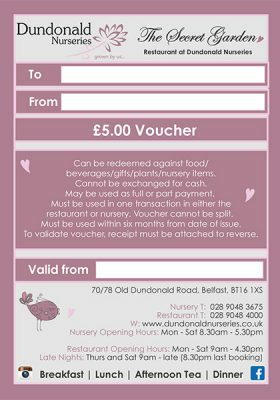 You can expect to receive your voucher within 5 working days alternatively you can pickup your voucher at The Secret Garden. Vouchers will all be sent recorded delivery.